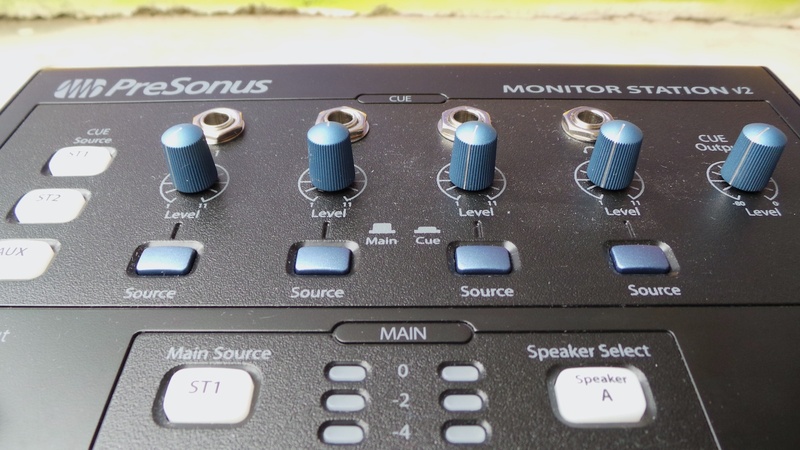 When you link your audio interface directly to your monitors, you may lack several things, starting with a volume knob, if you have bad luck and neither your interface, nor the speakers themselves, have one. You may also want to connect different sources to your speakers, besides your audio interface, like a CD player or an iPhone. And you may also lack headphone outputs, considering that most interfaces have only one or two headphone outs, which may not be enough when you play in a band. Not having reviewed the first Monitor Station when it came out, we decided to do a comprehensive review of this second version, not limiting ourselves to the new features alone. At first sight, the Monitor Station could resemble a super desktop audio interface: It has lots of buttons, inputs and outputs… Except it doesn't have any USB, Thunderbolt or FireWire ports. 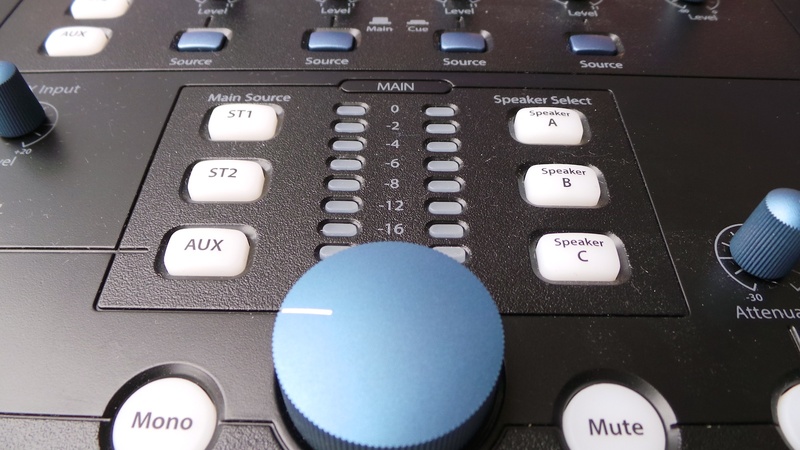 The box should be connected between your audio interface and speakers: Its job is to manage different sources and send them to different destinations, like a routing system. The Monitor Station measures 2.5" x 8.5" x 9" (63.5 mm x 216 mm x 228.6 mm) and weighs in a 6 lbs (2.72 kg), which allows it to sit tight in place. 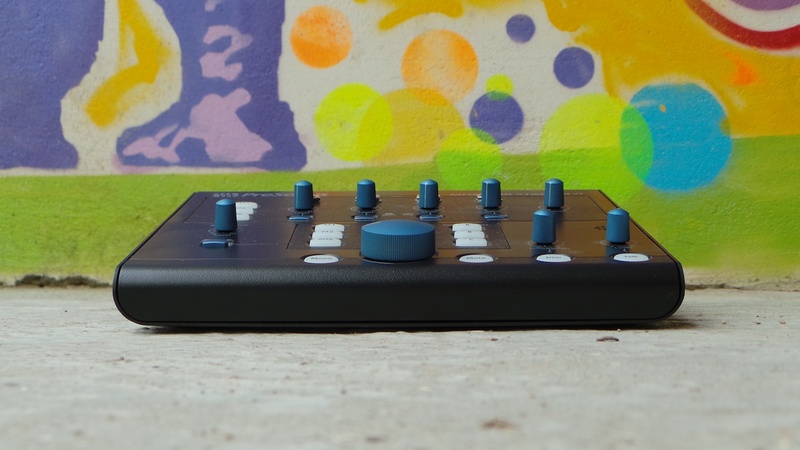 It will take up some space on your desk, especially if you already have a desktop audio interface, but it's all for a good cause: There's got to be enough room for all those knobs and in/outs somewhere! It has a sturdy feel: The knobs offer a good resistance, although we would have preferred for some of them to be bigger, like the main volume control, for example. The rubber buttons light up when you press them, which is very handy in use. The unit has a sober look ─ with its black-colored housing, version 2 is definitely more discreet than the first one, which I like. On the rear you'll find the power switch and the connections. Regarding the inputs, you'll find the two main sources ST1 and ST2 on TRS jacks: Here is where you should connect the outputs of your audio interface. There's also an AUX input on RCAs, but also on mini-jack, which is rather cool to connect a personal music player or a smartphone. The S/PDIF digital input is on a coaxial connector, but you'll have to choose between the AUX and S/PDIF inputs, with the help of a button: It's impossible to listen to both of them at the same time. As for the outputs, there are three stereo pairs on TRS to send the sources to up to three pairs of speakers. 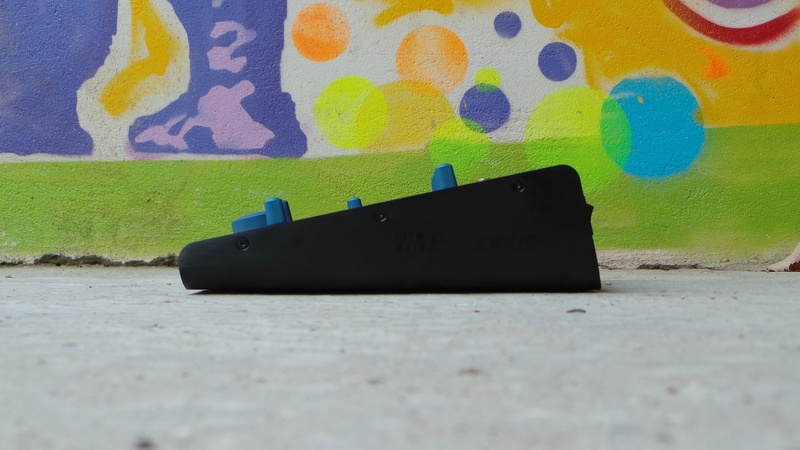 The volume controls to adjust the output level of each pair of speakers are also on the rear, which is smart, because, normally, once you set them you almost never need to touch them again. You'll also find two pairs of line-level stereo outs on TRS, to send the signal to a headphone amp if the four available outputs aren't enough. 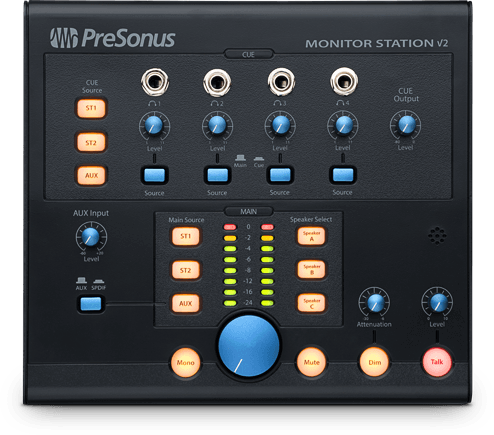 The first "Main" output provides the accordingly selected signal on the Monitor Station, while the second one is for the "Cue" signal, which you can also choose on the unit. 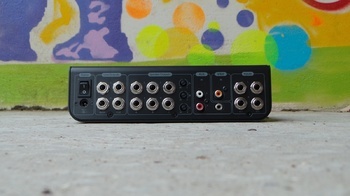 There are no XLRs because they take up much more space than the TRS jacks, and the phono input has vanished. It's a pity for people who have a turntable! The buttons and knobs are on the top panel of the Monitor Station. The upper part is for the headphones and the "Cue" out. 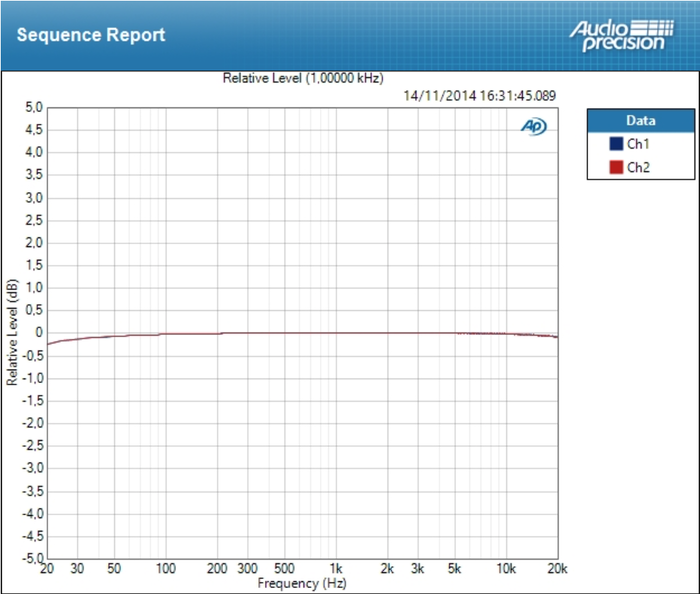 You can select the source that is sent to the headphones and the Cue output: ST1, ST2 or AUX. For each headphone, you have a volume control and a toggle button to choose either the Main or Cue signals. 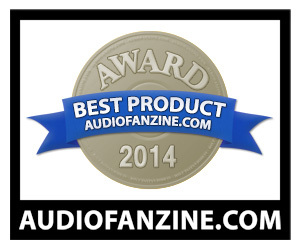 This means you are not forced to send the same thing to all headphones. Sweet! It's also worth noting that the headroom of the headphone outputs is more than enough for any type of cans, even high-impedance models. Finally, there's a Cue Output knob to set the level of the Cue output on the rear of the Monitor Station. On the bottom left are the controls for the auxiliary input. You can choose between the analog RCA/mini-jack or the digital S/PDIF inputs, which means it's impossible to listen to both of them at the same time. There's a volume knob for the AUX, in order to set it to the same level as the other inputs. 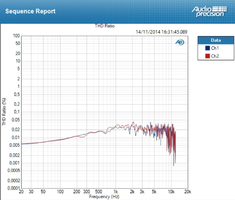 Finally, on the bottom right is the section where you decide what you output, especially to the speakers. You can choose the source or sources for the Main bus: ST1, ST2 and AUX. By default, you can actually sum all three sources, but the user can change this setting with a simple procedure (you have to press and hold a button while you power on the unit), so you can toggle between the three sources. This means you will only be able to listen to one source at a time, but pressing a button is enough to go from one to the other. This is the mode that you can use to quickly compare two sources, for instance. Just above the main volume knob you have two LED meters that show the input level. 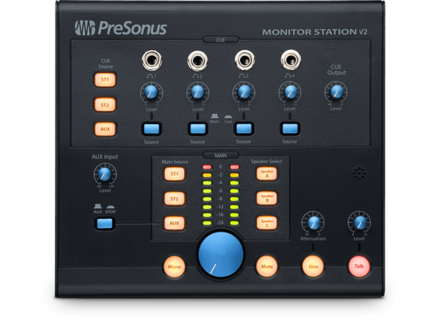 Another simple procedure will allow you to calibrate your Monitor Station to your home studio gear. 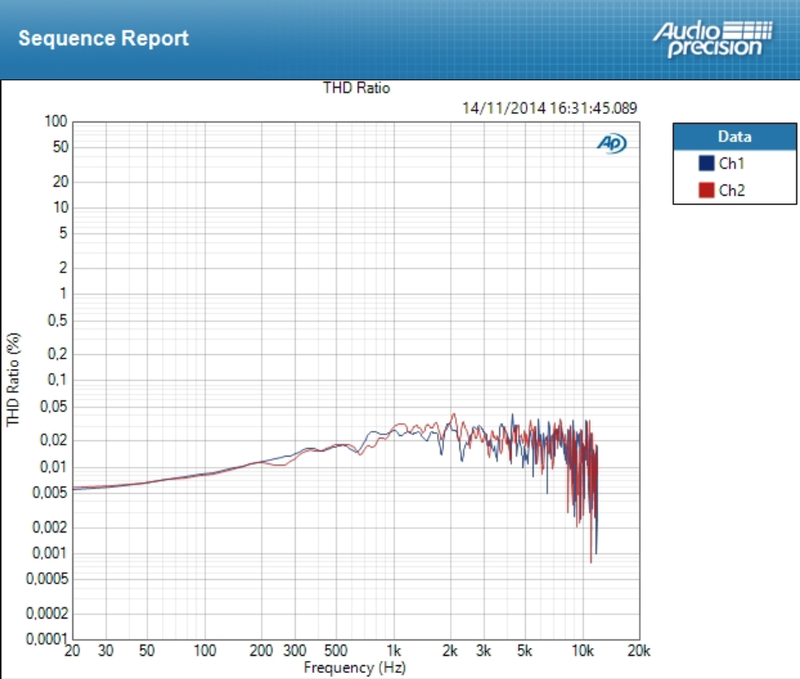 By default, 0 VU is fixed at +10dBu. 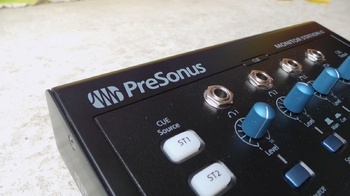 The three buttons to select the speaker pairs work in the exact same way as the source buttons, and you can also switch from Toggle to Summing mode pressing a key while you reboot. The user manual explains this in a very clear way. Last, but not least, are the main controls: Mono (which also affects the headphones if they are fed with the Main signal), Mute, Dim (with a knob to determine the attenuation), and Talk (with its own level control) to activate the talkback. Do note that engaging Talk automatically dims the signal, which is very nice: Whenever you want to talk to someone over the Talkback circuit, you also want to reduce the music level. In practice, the Monitor Station revealed itself very pleasant to use, although a bigger volume knob would have been preferable. Observant people will have noticed that the phono input available on v1 has disappeared, while Mackie's Big Knob ─ its most direct competitor ─ does provide one. Further, the mic input for the talkback has disappeared as well, even if the built-in mic does a very good job. Nevertheless, the new features are very welcome, like the mini-jack input, the volume knobs for the speakers on the rear to avoid involuntary changes and, especially, the S/PDIF input. Compared to Mackie's Big Knob, the Monitor Station has less line inputs and outputs, no footswitch connector for the talkback and no phono input. 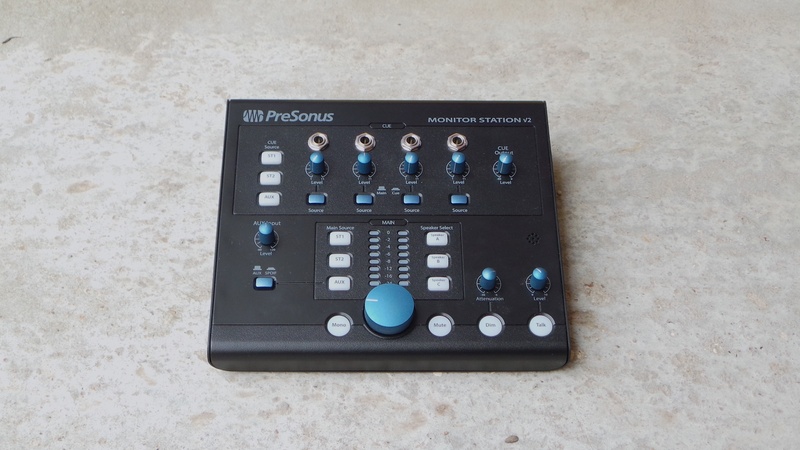 However, the Monitor Station has the S/PDIF input and two more headphone outs, besides the VUmeters, plus it doesn't have the Big Knob defects noted by some users: The talkback doesn't dim the signal and the mono button doesn't affect the headphones. 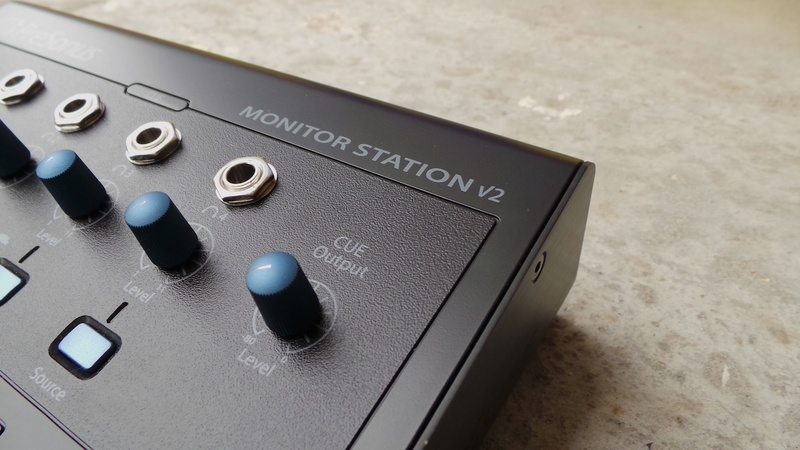 So, unless you absolutely need additional line inputs/outputs or you have a turntable, we recommend you to choose the Monitor Station V2. With a deviation of 0.123 dB, the result of the Monitor Station v2 is fine. 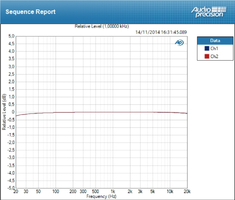 The signal is very slightly attenuated at both ends, which is quite normal, considering the price of the unit. Regrading the THD, it varies form 0.005% and 0.05 %, which is quite all right at this price point and on par with a good home studio audio interface. There's nothing to complain about in terms of transparency.